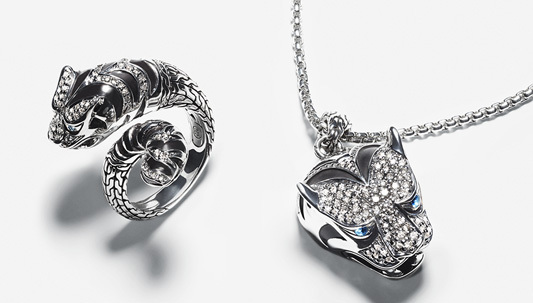 Nature in bold form is celebrated in the jewelry pieces of John Hardy’s Macan collection with tiger motif. The fact is, “macan” means “tiger” in Balinese. The mythical creature in Macan rings, bracelets, pendants and earrings is a white tiger with piercing Kabuki-style eyes, an animal – in Japanese drawings – of courage, passion and triumph. Additionally, the white tiger is known as the “guardian of the West” in ancient Japanese mythology, and as a life force associated with the aristocratic samurai warrior, of legendary bravery. Each and every sterling silver piece has a beautiful silhouette and elegant graphics, with many of them set with gemstones that include black sapphire, blue sapphire and diamonds, among others. The macan is an inspiring talisman, empowering for the wearer of jewelry crafted with, or of, its image. Like all John Hardy collections, Macan jewelry was created with the brand’s heritage of design, craftsmanship, quality and sustainability. We invite you to take a walk on the wild side with jewelry from the John Hardy Macan collection.